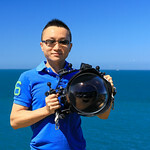 Yen-Yi Lee is an award-winning Taiwanese underwater photographer with endless passion for the ocean. He started underwater photography in 2010, and since then, he’s been deeply fascinated by the mystery of the ocean. He likes to observe the relationship between the marine lives and human beings. He always commits himself to create a unique and artistic reflection of what he sees during his exploration - to capture the beauty of the ocean and share it with people, furthermore, to remind people the importance and urgency of marine conservation. He has won many prestigious international underwater photography competitions, including championships of 2015 ADEX, 2017 Raja Ampat UW Photo Competition and 2012 DRT; gold medals of 2018 Ocean Art, 2017 Lens Beyond Ocean , 2017 Voice of The Ocean, 2016 Beneath the Sea, 2016 Wetpixel Deep Indonesia, 2015 ADEX and 2013 DRT.